Vijay Krishna (Sai Dharam Tej) is a guy who is called loser because of bad luck and due to lack of social skills. He is often misunderstood and rejected by everybody except for his father (Posani Krishna Murali). He is an intelligent graduate who has an idea for an app and looks for investors. Story of the film is about how he undergoes through many hurdles before becoming victorious. Story - screenplay - direction: Story of the film is decent with a good twist at the end. Director Kishore Tirumala has penned a good story, but couldnt translate it effectively onto the screen. First half of the film is alright. But second half becomes placid except for Vennela Kishore’s episodes. The character of hero is projected as loser. But, he is not a loser. He is an intelligent guy who is not having smart social skills. The director depended heavily on dialogues and filled the entire film with them by not giving enough scope for visuals and emotions to get projected. A serious story like this should be deftly balanced with fun elements. But the film becomes completely serious in the last half an hour of the film (post Mumbai episodes). The characters of Nivetha Pethuraj and Posani Krishna Murali are well written. Other departments: Songs scored by Devi Sri Prasad are good and are different from his regular stuff. Background music is also good. Cinematography by Karthik Gattamaneni is decent. Visuals of the film carry a color theme. Dialogues written by Kishore Tirumala are good and they dominate the flow of the story as there are too many of them. Editing is alright. Production values by Mythri Moviemakers are very good. Analysis: First half of the film is okay. Second half becomes predictable except for a twist towards climax. Director Kishore Tirumala writes a decent story, but fails to transfer it to big screen in an engaging manner. Some episodes are heart-touching. But, the director made this film verbose by writing too many dialogues. 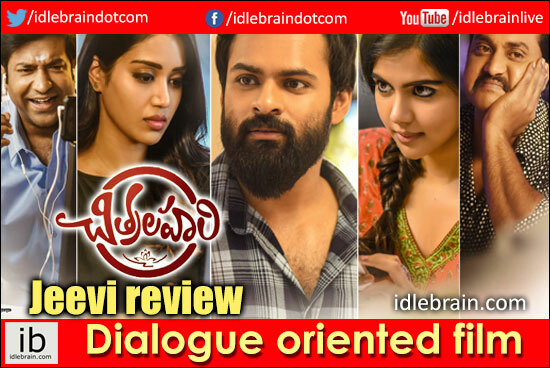 Plus points of the film are Sai Dharam Tej, dialogues, music and Nivetha Pethuraj. On the flipside, narration is slow and we don’t empathise with hero character in second half. Intent of the film is good, but execution is not good enough to carry over the finish line.